Wondering if you should RENOVATE or REBUILD your luxury home? Avoid costly mistakes, stress and disappointment when it comes to renovating or rebuilding. Download our guide that clearly outlines the things you first need to consider. We are committed to delivering premium quality workmanship & above all customer service. We ensure your renovation is stress-free and will be delivered to you on time and within budget. SmartReno can help with your new Custom Luxury Home build; whether it be a full Design & Construct, a Knock Down Rebuild, or even if you already have a design in mind. Our team is committed to delivering a premium quality custom luxury home with expert workmanship and above all customer service. Home Extensions have become an increasingly popular choice for homeowners who prefer to stay in their location while needing more space. It is a very cost-effective option suited to changes in lifestyle. 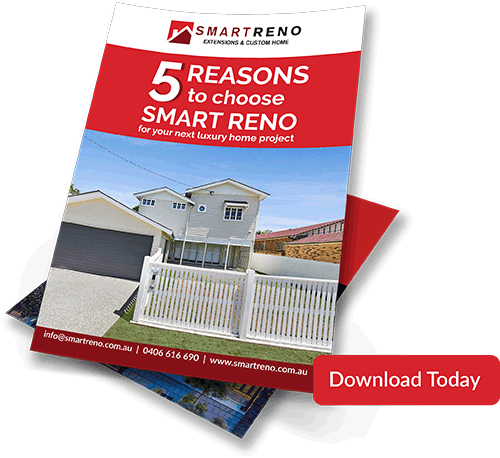 SmartReno are specialists in Home Extensions when it comes to creating more space in your home. Undertake a STRESS-FREE RENOVATION…It is possible. 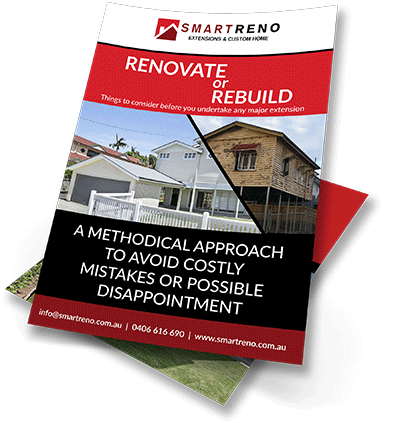 With SmartReno your project will be directly looked after by a qualified builder with extensive knowledge in every aspect of your Design and Construct, Knock Down Rebuild, Home Extension, or Home Renovation. Our business is proudly built on excellent communication and healthy relationships with our clients, so we can fully understand your needs and always aim to exceed your expectations. You might have heard horror stories of builds taking months too long, only to receive a shock final bill after completion. However, choosing the right builder is the key to a positive experience. SmartReno understands that the last thing you need is unnecessary delays and disruptions to your routine. We ensure that your project adheres to the agreed set timeline, and will inform you of any delay as soon as identified with the intention to compensate for the delay on other construction activities, where possible. Through our cost estimation software, we will provide you with a detailed scope of works which can ensure you we have allowed for all details and steps to build your project, there will be no hidden costs or nasty surprises. If we miss something we will cover the cost. If there is no change order from your end, we will not ask for extra cost. We will construct what is stipulated in the scope of works for no cost variation, Guaranteed! That’s right! Not only will you be dealing directly with your builder throughout your construction project, your builder is always available to answer any questions, not matter how trivial you think they might be. SmartReno believes that “No question is a bad question”! Ask away through our online portal, any time of the day 24/7 – that’s the SmartReno difference. We maintain open communication and complete transparency, so you are always in control. Customer service and communication is paramount to our values. Therefore, we will provide you with your own individual client portal where you can be kept up-to-date every step in the process, whether you are at home, at work, on the road or on holidays.